It’s amazing how fast time seems to go by - 1/4 of the year is gone, but that also means it’s officially spring time! New plants are coming in! We bring stuff in weekly during this time of year, so be sure to stop by and see what we’ve got available, and check out our own gardens that we are always replanting, providing new and cool design ideas! Did we mention the Spring Garden show at South Coast Plaza? It’s almost here - stop by and see us, it’s A LOT of fun! Look for our booth that will be full of lots and lots of new, unusual and very cool plants and garden accessories. For the first time, we have entered the competition garden design! The competition gardens will be featured on the first floor of South Coast - you can’t miss ours, it’ll be the container garden done in the ‘Dr. Seuss’ theme! The Spring Garden Show runs April 26th through the 29th. Visit www.springgardenshow.com for more information. *Color, color color! Shape, shape, shape! Foliage, foliage, foliage! This is the prime time of year to be planting! 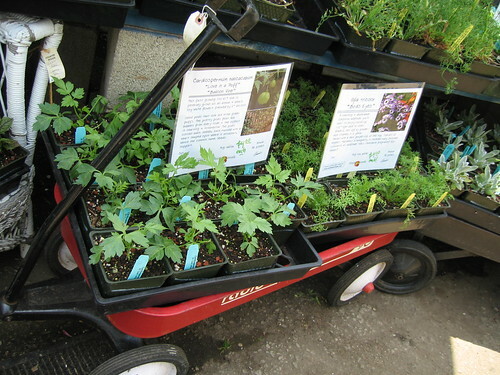 Hit up the nurseries (especially ours...), check out what your neighbors are doing, get planting! Break out of your design rut and try new plants while you’re at it! *Don’t forget to pinch and prune! Deadheading (cutting off the dead blooms) is important to do this time of year to ensure that your perennials will continue to bloom throughout the year ahead. *Feed your hungry plants! We always go organic here at Johnnye Merle’s - check out our great selection of organic fertilizers next time you are in, they are even on sale right now! *Bring your garden indoors! We are big believers in having plants wherever we can, and that includes INSIDE of the home as well. Check out topiaries, start a kitchen herb garden or get some ‘carnivorous’ plants for the kids! *Hit up the bookstore – garden design magazines are always full of great ideas and inspiration! Watch for next months “Garden Geek” Newsletter in early May! Don’t forget, Johnnye Merle’s is now designing gardens for our fellow garden geeks! Leave a voicemail at 714-744-4981 or email us at johnnyemerle@yahoo.com for more info.